This article is taken from "The Connoisseur", an illustrated Magazine for Collectors, Volume LI (May-August, 1918). 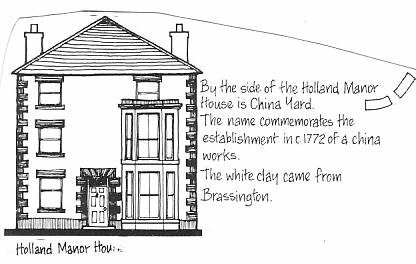 It describes china that was made at Wirksworth, in Holland Manor House, about the year 1759, attracted there by the existence of a beautiful white clay found in the lead-mines at Brassington. The China Factory at Wirksworth, in Derbyshire. THE early history of English china is still full of problems, in spite of long-continued research. While it is now hardly probable that entirely new factories will ever be brought to light, there is still a fair margin for discovery as to the output of the lesser works, and, for the matter of that, of the more important ones -also, especially as regards their earlier years. Among the former we may place the factory at Wirksworth, in Derbyshire, which, although noticed by certain past writers, has, nevertheless, not yet been fully and critically investigated. The present article does not profess to be in any sense exhaustive, but the facts here presented to the readers of THE CONNOISSEUR will probably be sufficiently new to constitute what is practically a rediscovery of the whole subject. The writer feels justified in making this claim, for the simple reason that modern works on china almost entirely ignore the subject, notwithstanding the earlier references quoted below. And even if Wirksworth china does not stand in the front rank among collectors' treasures, an enquiry into the subject may, nevertheless, clear up certain matters that have hitherto lain about the borderland of knowledge. At all events, it is obvious that the question presents a problem which should be faced in the interest of the whole subject of old china. A first statement of this new approach to the subject was made by the present writer in the Journal of the Derbyshire Archiological Society for the year 1916, and attracted some general attention. Since then much fresh light has been gathered, and further specimens have become accessible for purposes of illustration. This article is therefore entirely rewritten. But it is highly probable that the question will continue to expand, and that certain matters, still obscure, will eventually be cleared up. Mr. Llewellynn Jewitt, writing about the year 1877 (Ceramic Art in Great Britain), gives a quotation stated to be from Dugdale, which seems to indicate that china was made at Wirksworth, in the Holland Manor House, about the year 1759. He says the attempt was unsuccessful, but as the factory went on for some years, this remark would appear to refer to the financial side of the undertaking. The same author quotes from a lease (dated 1777) concerning the property, in the following terms : " All those several messuages, etc., heretofore used for the making of china ware," and comments thus: "So that at that time the first china works had probably ceased to be in operation." The italics are mine. What does Jewitt mean by " first china works "? We naturally suppose that there was a later period of china-making here, and that the years before 1777 were not the limit of the period of output. The indications are that there was a second and later period. started a china manufactory at Wirksworth, in Derbyshire." The context explains that he (Billingsley) was attracted there by the existence of a beautiful white clay found in connection with the lead-mines of the neighbourhood. The same author states elsewhere that Billingsley attempted to establish china works here, probably owing to felspar being found in the locality. This time, how ever, he says "there is no proof." Jewitt is rather loose sometimes. The next author to refer to the subject is William Chaffers; who, in 1863, published his Marks and Mono grams on Pottery and Porcelain: "About the year 1770 there was a manufactory of china here (Wirksworth), said to have been established by a person of the name of Gill. Pottery was first made, and a punch-bowl of copper-coloured lustre, in the possession of Mr. Lucas, of Bentley Hall, Ashbourne, is believed to be a specimen of the manufacture. They afterwards made porcelain (soft paste), the usual decorations being flowers roughly painted, and shells ; tea services (with) white and gold borders. No mark is known." Chaffers again, in 1872, in a noble work entitled Keramic Gal lery, makes a slight but similar notice ot the factory, and gives what is practically the only illustration that has ever appeared among these older writers. But it is insignificant and of little use. We now come to a much fuller reference to the subject, from the joint pens of William Bemrose and Alfred Wallis, published in 1870. In that year a Fine Art and Industrial Exhibition was held in Derby, and the authors above named wrote, for the guidance of visitors, a sketch of the history of fictile art in the county, under the title of The Pottery and Porcelain of Derbyshire. The passage dealing with Wirksworth is interesting in the extreme, though it seems a little high-flown in its statements: " This factory must have been upon a very large scale, and probably was even more extensive than the Derby works, which it preceded as a china factory,* but to whose rising power it was obliged to succumb in 1777, when it was finally broken up. The goods made here were of the very finest description, and specimens may occasionally be met with, both of china and earthenware, the decorations of which are very similar to those of Lowestoft. " We have not space to give the whole quotation. The writers say the green colour is bright and peculiar, the paste white and very translucent, the pottery soft and fragile. It might seem that there were important specimens in this exhibition which have since been lost, but on turning to the exhibition catalogue we are surprised to find only three small exhibits, viz., "cup and saucer," "custard cup and saucer," and "sucrier." The following passage also seems to lack critical quality, but we shall have something. more to add on this side of the subject later on : " We are in a position to state that figures of a graceful character, beautifully moulded urns, and lamps, were made here." It is when we come to the conclusion of the notice that we find ourselves able to agree with these authors, on account of the evidence presented by the illustrations to this article : "Tea ware of a find and translucent paste (was) manufactured." ovens, and numerous fragments of unglazed wasters, were found. best is fine and tolerably translucent; smooth, fragile, and slightly warm-grey in colour. Many thin pieces are evidently parts of tea services, and others, thicker and finely moulded, seem to bear out in some degree the eulogy in the exhibition catalogue as to beautifully moulded objects (see No. X.). Jewitt's finds seem to have been lost long since, but if he turned up more than were found in 1914-and he may well have done so, being first on the scene-there is some justification for the Bemrose assertions. But at present these seem overdrawn. Nothing whatever is known of any figure work. The Wirksworth paste is not the softest variety. It is cut by the file only with considerable pressure. But the magnifying glass shows a dull, flour-like powder, and not vitreous particles. Here and there along the fracture there are shining particles, perhaps of unreduced felspar. But the general appearance is that of dull lump-sugar. Chemical analysis is being awaited*. The writer is of opinion that the finds indicate two periods-the period to 1777 and a period after 1804. The photograph (No. X.) shows what are evidently fragments of the earlier products, but, unfortunately, there are not many complete specimens extant. The cup and cover (No. VIII), belonging to Mrs. Meade Waldo, seem of this period. They are well potted, though the glaze is some what heavy in hue and slightly peppered in places. The ornament is bold and striking, and consists of strong but not crude colouring. Roses, honeysuckle, and foliage are the motive, and the handles are ribbed and twisted. At the points of attachment of the latter there are small, raised, delicately moulded daisies left in the white. This specimen is authentic beyond question, as Mrs. Meade Waldo has an interesting little document, which is both ancient and conclusive, stating that it was made at the china works, Wirksworth. village among the hills as a product of the old Wirksworth factory. We do not wish to force this consideration, but there is something to be said for these and other examples by reason of the permanence of old country families in this quiet corner of Derbyshire. No. I. shows the teapot with stand and cream jug; No. II. a cup and saucer. There are six of these,latter, the cups, like all others of the period, being without handles. It will be noticed that the teapot and cream jug differ slizhtly in the handles. But in every other respect these and the cups and saucers are strictly uniform in style, body, and glaze. The jug and teapot stand may have been added during the vicissitudes of a century or more. The basin (No. II.) does not belong to the set, but it is evidently of the same origin. The colours are crimson, red dish-brown, blue-green and yellow, with swags of dots in puce and little scrolls at intervals. All the pieces are much discoloured by age and use. In the early part of this article a remark by Mr.W. 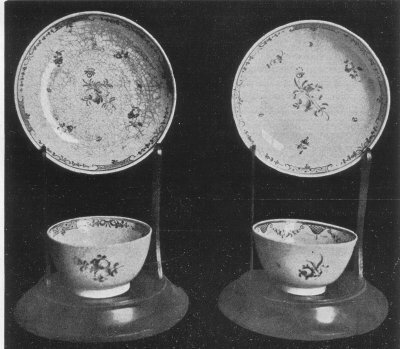 Bemrose was quoted concerning a similarity between the decorations on Lowestoft china and that made at Wirksworth. We presume this writer was thinking of the pink panels or labels, filled with criss-cross, scale, or waved lines, and disposed along the borders of certain Lowestoft specimens. This very effective decoration is seen in No. V. in a series of narrow cartouches or panels along the edges. The more ornate teapot in.No. VI. shows it also. The dotted swags in the Manor House set (Nos. I. and II. ), and similar forms in No. IV., are also reminiscent of Lowestoft, as are also the ribbon loops in No. V. The prevailing style of detached sprigs and sprays of flowers is another touch of ornament in common. 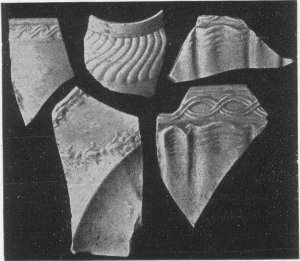 And as to the body, the following passage from How to Identify Old China, by Mrs. Willoughby Hodgson, is almost a complete description of much of the waste material dug up at Wirksworth: "Lowestoft porcelain is soft paste, but not of uniform softness. Indeed, some pieces are very nearly allied to hard paste. It is of a creamy tint." The authoress adds : . "The glaze is slightly blued," which also describes many of the Wirksworth examples. Again, if we turn to The China Collector, by Mr. H. W. Lewer, we find in the chapter on Lowestoft, page 187, many details which apply to the Wirksworth examples. ---------------------------------------------------------p.30-------------------------------------------------------------- biscuit surface or in the fracture. In Its unglazed condition it has, when at its best, a beautiful eggshell surface, and the more delicate fragments vary from a sixteenth to a twentieth of an inch in thickness. They often show traces of underglaze blue decoration. No. III. shows a tea service belonging to Mr. William Fox, of Wirksworth, who has by far the most considerable collection of reputed Wirksworth china known to the writer. The nucleus of this tea service was certain pieces from the Bemrose collection. At a later date, other exactly similar pieces were purchased at an important sale in Wirksworth. They had long been in the possession of a local family, and were always considered to be of local make. The colours are green, pink, blue, lilac, and orange. The execution is free and somewhat loose, especially in the wavy red lines, which run round in the form of swags or festoons. The set shown in No. IV. has a still more curious history. A teapot, stated by W. Bemrose to be of Wirksworth make, had long been in the possession of Mr. Fox, when similar pieces of a tea service came to light, belonging to Mrs. Hamilton Gell, now of Devonshire. The Gells of Hopton and Wirksworth were among the partners of the original undertaking. Other partners named by Jewitt were the Hurts of Alderwasley and the Burdetts of Foremark, both being local families of long-established standing. There is other evidence in the Hurt family concerning certain old china, long treasured for its family associations. It closely resembles the specimens here illustrated. No. V. shows two cups and saucers belonging to a set which was, at one time, almost famous in Wirksworth, so generally was it regarded as a relic of the old factory. It belonged to a Mr. Richard Wall. But most of the pieces have long since been dispersed. This was evidently a very dainty and charming service. It is painted with roses, bluebells, pinks, scattered sprays, and bows of ribbon, and the pink cartouches along borders, already referred to. There is a good deal of this style of thing about Derby and neighbourhood, and sometimes it is called Lowestoft by dealers. Others loosely call it Staffordshire, or tell you they do not know. 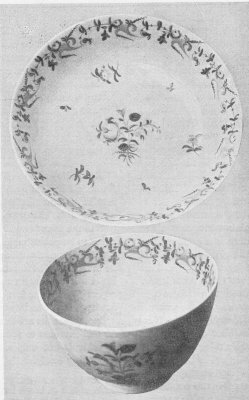 An interested reader, seeing the illustration of these cups and saucers in the Derbyshire Journal, sent the writer a piece of a saucer which, he said, had always passed as New Hall. Save that the paste is much whiter and the shape fluted or gadrooned spirally, the whole thing is identical. And the paste is about of the same degree of hardness. Of the specimens shown in No. VI., the two teapots bear a Bemrose attribution, and have been in, the possession of Mr. Fox for some years. The glaze is a trifle uneven, with a somewhat greasy reflection. The colouring shows no novelty, but the tasselled ornament of one is very effective. The cup and saucer, ribbed radially and with scalloped edges, are decorated in gold and without colour. They are charming specimens, and the only examples yet discovered bearing gold enrichment. The authority for their attribution is again Bemrose, and, according to the exhibition catalogue, there should be other gold decorated specimens about. See also the quotation from Chaffers, page 26. Other objects belonging to the same owner are the basin and jug in No. VII. Here, again, is the characteristic pink ornament. The jug is spirally fluted. The basin shows a shell in heavy brownish colour (see again quota tion from Chaffers), and roughly painted. The Oriental dish is painted in an underglaze blue pattern, which resembles precisely certain fragments from the wasters. The mug is clear white, witb cornflower decorations and lines. This and the gold-and-white cup and saucer seem of a superior quality. The cup and saucer (No. IX. ), preserved in the Derby Art Gallery, are the only examples of Wirksworth china which the museum contains. These objects are quaint and charming. The wing-like flowers are carried out in blue. But the tone of the glaze is somewhat heavy, perhaps owing to age and use. The photograph for this illustration was taken by special permission of the committee. With reference to the statements of various authors that earthenware and lustreware were also made at Wirksworth, we may add that the "finds" at the Manor House tend to confirm these assertions. But, at present, the evidence is incomplete. An interesting teapot, with a raised arcaded pattern around it and scalloped edge, was shown in the previous notice of this subject, but it appears to be old salt-glaze, and has no clear evidence as to origin. Should any readers of THE CONNOISSEUR be further interested in this question, the writer will be glad to receive communications on the subject. The writer already owes thanks to numerous correspondents, and also to the friends and collectors who have allowed their china to be photographed. And perhaps a word or two of personal explanation may be allowed. The author holds no brief for the case, and is not out to maintain any pet theory. The sole aim and object is to sift the facts from the fiction, and the question has been stated as impartially as possible. Special thanks are due to the editor of this magazine for the invitation to ventilate the subject in the interests of what is not only a delightful pursuit, but a most fascinating study. There was certainly a porcelain factory at Wirksworth during this period as contemporary records mention invoices for materials, advertisements for labour and sale of stock etc.. Josiah Wedgwood mentioned this factory in 1775 "...a china works, lately begun at Wirksworth, by Mr Gell of Hopton who lately made some use of a fine white clay found near Brassington in Derbyshire..."
Goods produced included tea and coffee wares, bowls, figures, jugs vases etc. with on and under glaze printing being done. It is fair to assume that, given that the Derby factory was only 13 miles away, quite a number of workers from this factory would have been employed at Wirksworth and taken their various skills with them. So that when the products are identified we should probably look for some similarities with the goods from Derby. Pierre Stephan and his son John are both recorded as going to Wirksworth from Derby. The factory was in decline by 1777 and sales notices in the Derby Mercury tell of the disposal of equipment and stock. It is possible that there is some connection between Wirksworth and the infant factory at Caughley and that Turner may have bought some of the moulds etc.